Though the M1 is rare in its own right, few people know of it’s racing heritage and the rarest M1 ever produced. In the mid seventies, the 3.0 CSL’s were very competitive, but BMW needed to contend with Porsche’s fire breathing 935 Turbos. And that meant an overhaul. Having been conceptualized as the basis for attacking the Group 5 ‘Silhouette’ category of the World Manufacturers Championship, many were surprised when BMW commissioned March Engineering in England to carry out the M1’s Group 5 transformation. After successfully campaigning 320i Turbo’s throughout 1976, the expectation was that an in-house M1 would arrive to challenge Porsche. Group 5 meanwhile had originally been scheduled for a 1975 inauguration, but the FIA eventually delayed its arrival to allow more manufacturers to develop qualifying cars. Providing considerably more scope for development than Group 4, Group 5 dictated little more than a vague resemblance between a racing car and the 400 road-going machines on which they were based. March’s chief designer, Robin Herd, led the exciting program; BMW Motorsport taking responsibility for the engine whilst everything else was done in England on their behalf. These two companies had already forged a successful alliance in Formula 2 and sports car racing, March having been granted exclusive use of BMW’s two-litre powerplant during the early 1970’s. For this new car, John Gentry created an all-new aluminium monocoque that was much lighter and stronger than before. It had been designed to initially accomodate the familiar Group 4 spec motor although an 800bhp twin turbocharged unit was in development back in Germany. As the full house engine wouldn’t be available until after the 1979 Le Mans, a short-term measure saw Rand Linger of Freiburg supply 480bhp versions of the straight six mated to a Hewland LG600 gearbox. The striking bodywork was fabricated from a mixture of lightweight aluminium and composite and resembled the production M1 in just its basic outline, this thanks mainly to a massive new front spoiler, stretched tail and extended wings. This chassis was known as the MKI. Testing was underway by March 1979 with the Linger-engined chassis MKI successfully conducting 2000-miles of trouble-free running at Silverstone, Snetterton and Goodwood. The new car was also demonstrated at Brands Hatch by Marc Surer, but the FIA were about to drop an eleventh hour bombshell that would have massive implications. A new ruling that demanded 400 road cars before Group 5 homologation could be granted killed any chance of the M1 competing in the Silhouette class short-term. Nevertheless, a glimmer of hope lay across the Atlantic where orders had been placed by IMSA competitors Peter Gregg and Jim Busby, both of whom saw the potential for a twin turbocharged M1 racer. The first customer car was ready half way through November ’79 and had been allocated to Gregg, but actually ended up with Busby. Fitted with a more refined aero pack than MKI, it was shaken down at Goodwood. A month later, BMW Motorsport’s experimental engine department announced they were ready to start benchtesting the first twin turbocharged 3.2, but tellingly, no mention was made of the M1. The entry list for the 1979 24 Hours of Le Mans contained two very interesting BMW M1s. 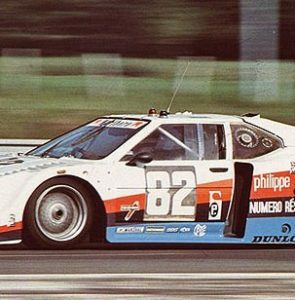 With its maximum-regulation Group 5 bodywork, the March Engineering entry looked like an M1 on steroids, with its extended body length, massively oversized fenders, and enlarged front air dam and rear wing. In addition the body was built on a lightweight spaceframe, and sported a 3.5-liter turbocharged engine. Ultimately, three race cars rolled out of the March workshop and onto racetracks around the world while a fourth dummy car was produced but never finished. The March M1 is very rare as only 2 cars were actually completed by factory. Three chassis were assembled and numbered in 1979 : MKI, MKII and MKIII, MKIII was built in replacement of MKI crashed at Brands Hatch in 1980. One was kept original and restored, one was acquired and raced by Jim Busby, modified with a Chevy engine and Indy rear suspension. The program March M1 lasted only 1 year from mid 1979 to mid 1980 for several reasons: Car was not as fast a 935s, BMW lost interest in M1s due to F1, and Group 5 had no future after 1982. 5-litre Traco Chevrolet V8 engine installed. This car was sold through BringATrailer.com in 2010 and has since been racing in vintage races around the world. This collection, the fourth chassis, was never finished by factory, it seems that work stopped after BMW gave upwith the March project in mid 1980, it was certainly built to be a spare chassis as MkIII, the spare one, has already been used in the rebuild of MKI. The uncompleted monocoque, parts and molds remained at the factory until 1993 it was purchased on Wednesday September 8, 1993 from the liquidator of Marchs assets Edward Symmons & Partners during the auction held at Bicester. He intended to complete the car but did nothing and simply put the car into storage. It was later sold and the auction link below and its whereabouts are now unknown. The Munich firms interest in a Group 5 M1 had seemingly withered with the FIA’s controversial U-turn on homologation requirements. As a result, the handful of events run in 1980 were, like 1979, contested with criminally underpowered Group 4-spec engines that massively disadvantaged what was a potentially world beating design.The entire affair was nothing short of a disaster, a string of retirements and disappointing performances normally relegating the cars to also ran status. In the end, the works machine being retired after the 1980 Le Mans. And with that failure, the March M1 was all but forgotten into the history books.